Hawkwood Plant Nursery is Organiclea’s food growing and plant production site. Work is carried out by a team of growers from the workers coop and lots of volunteers who support the project’s aim to encourage more food growing in London. The site is open for regular volunteer days on Tuesday afternoons, Wednesdays and Fridays. The last Sunday of each month is an open day where all visitors are welcome to drop by. We have regular events at the Nursery and run a training programme. Organiclea has been growing food in Northeast London for over 10 years. The Hawkwood Plant Nursery site is a more recent and exciting part of this work. 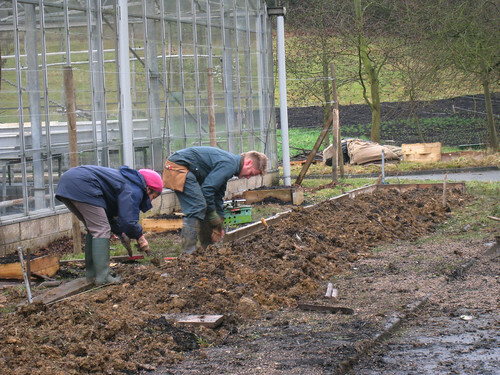 In January 2009, volunteers from Organiclea with many friends, started growing plants and food crops in the glasshouses – trials and hopes. 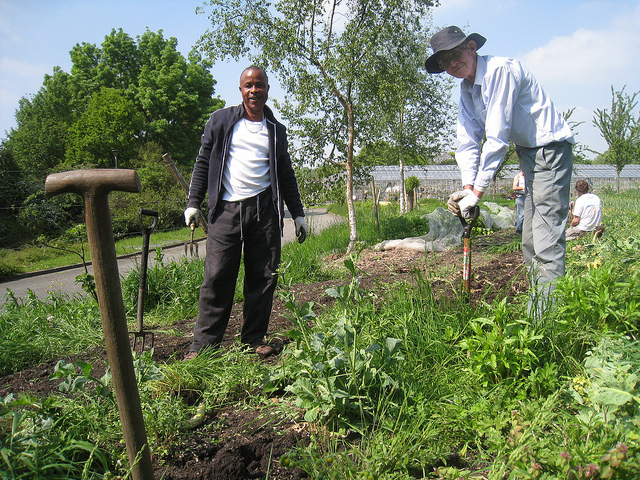 By winter 2009 we had some funding and a 10 year lease with Waltham Forest Council for the development of this 12 acre site as a community market garden and food growing resource base. You can follow the seasonal pattern of our work through the blog of one of our growers. Hawkwood is on the edge of the London Borough of Waltham Forest, and borders Epping Forest. The site includes extensive glasshouses, open fields, scrubland, and woodland edge. 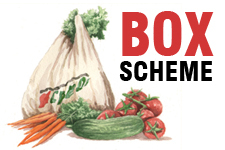 Unused for some time, we have turned the site over to the production of a wide range of fruit, vegetables and herbs, by clearing land, improving the fertility of the soil, creating raised beds, repairing the glasshouse, developing irrigation systems and building a classroom. As well as developing 4 acres of market garden, the glasshouses allow us to propagate vegetable and herb seedlings which are sold to local individuals and community groups who may not have access to an indoor growing space and appreciate the support of our healthy, hand-raised vegetable plants. Plants are sold through local market stalls and to community food projects (click here). With production taking place on the edge of London, close to where we are distributing it, we are producing fresh food with high standards of sustainability, using organic and permaculture principles (click here). Hawkwood offers a great opportunity to learn about organic food growing in a friendly supportive environment, and we are keen for more people to join us.